We describe a method for inducing neutrophilic pulmonary inflammation by challenge to aerosolized lipopolysaccharide by nebulization, to model acute lung injury. In addition, basic surgical techniques for lung isolation, tracheal intubation and bronchoalveolar lavage are also described. Roos, A. B., Berg, T., Ahlgren, K. M., Grunewald, J., Nord, M. A Method for Generating Pulmonary Neutrophilia Using Aerosolized Lipopolysaccharide. J. Vis. Exp. (94), e51470, doi:10.3791/51470 (2014). Acute lung injury (ALI) is a severe disease characterized by alveolar neutrophilia, with limited treatment options and high mortality. Experimental models of ALI are key in enhancing our understanding of disease pathogenesis. Lipopolysaccharide (LPS) derived from gram positive bacteria induces neutrophilic inflammation in the airways and lung parenchyma of mice. Efficient pulmonary delivery of compounds such as LPS is, however, difficult to achieve. In the approach described here, pulmonary delivery in mice is achieved by challenge to aerosolized Pseudomonas aeruginosa LPS. Dissolved LPS was aerosolized by a nebulizer connected to compressed air. 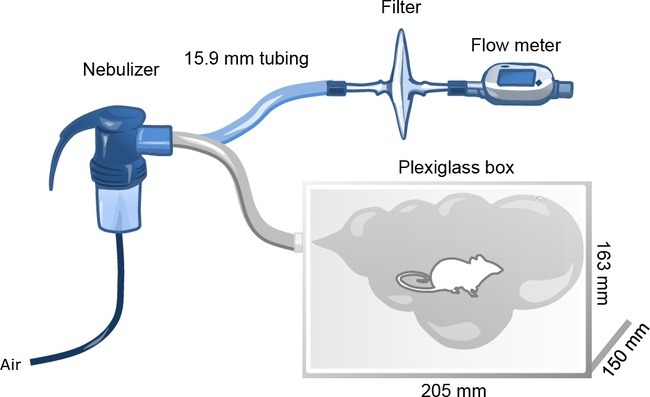 Mice were exposed to a continuous flow of LPS aerosol in a Plexiglas box for 10 min, followed by 2 min conditioning after the aerosol was discontinued. Tracheal intubation and subsequent bronchoalveolar lavage, followed by formalin perfusion was next performed, which allows for characterization of the sterile pulmonary inflammation. Aerosolized LPS generates a pulmonary inflammation characterized by alveolar neutrophilia, detected in bronchoalveolar lavage and by histological assessment. This technique can be set up at a small cost with few appliances, and requires minimal training and expertise. The exposure system can thus be routinely performed at any laboratory, with the potential to enhance our understanding of lung pathology. Lipopolysaccharide (LPS) is a cell wall component of gram negative bacteria1. Challenge to LPS is a well-documented model of acute lung injury, a syndrome characterized by acute neutrophilic inflammation and edema2. In addition, pulmonary neutrophilia is also a hallmark of chronic obstructive pulmonary disease (COPD)3, and LPS challenge in humans has been used to model COPD exacerbations4. Thus, experimental models of LPS exposure are clinically relevant and valuable tools to understand human pathology. The objective of the pulmonary delivery of aerosolized LPS described here is to generate a neutrophilic inflammatory response in the conducting and respiratory airways, without systemic involvement. Several techniques of LPS challenge have been described previously. Intra-venous injection of LPS is the most commonly used route of administration. Although this technique is easily accessible, the primary damage is to the endothelium, with secondary destruction of the pulmonary epithelium following neutrophil migration to the lung. Intra-venous administration also induces systemic inflammation2, which may complicate the clinical picture in animal models. Systemic inflammation is in contrast not observed with intra-tracheal administration. This technique, however, is labor intensive and requires anesthetics as well as considerable training5,6 . Furthermore, pulmonary deposition by this route of administration is dependent on breathing7. Thus, pulmonary deposition is affected by the depth of anesthesia needed for the intra tracheal administration and variable deposition in the airways may be observed. In contrast, pulmonary delivery with aerosolized LPS requires minimal training, and can easily be accomplished on a large number of animals with little or no variation between individuals5,8 . A recent study confirms that aerosol delivery is superior to the intra-tracheal route with regard to deposition, and that more relevant doses of LPS induce neutrophilic inflammation with this model8. Previous studies have demonstrated that challenge to aerosolized Psuedomonas aeruginosa LPS generates a marked inflammatory response in the airway lumen and lung parenchyma, including the alveolar spaces9,10. The inflammation is characterized by a predominance of neutrophils and presence of pulmonary edema, and can thus be used to address pathogenesis of acute lung injury and gain further knowledge of the mechanisms contributing to disease pathology. The animal studies were approved by the Northern Stockholm animal welfare ethics committee. The experimental procedures were performed in compliance with Swedish law. Dissolve 0.5 g purified P. aeruginosa LPS in 50 ml sterile saline with gentle agitation and verify dissolution. Dilute 1 ml dissolved LPS in 9 ml sterile saline, to a final concentration of 1 mg/ml. Protect from light with aluminum foil and store at -20 °C. Thaw solubilized LPS in the dark at room temperature and mix well immediately before use. In a ventilated level II biohazard hood, insert a red inlet into a nebulizer, and connect the nebulizer to pressurized room air via the tubing provided by the manufacturer (review scheme presenting the experimental devices in Figure 1). CAUTION: appropriate personal protective equipment, including a half face piece reusable respirator with particulate filters, goggles, gloves and protective garments should be used during the course of exposure. Figure 1: Schematic presentation of the experimental devices used for generating an aerosol. The inlet of the nebulizer is connected to an air supply. The outlet of the nebulizer is first connected to a flow meter via a 15.9 mm tube and an air filter, and air supply is adjusted to 5.0 L/m at 2 kbar pressure. The outlet is next connected to a Plexiglas box fitted with removable lids and 5 mm holes to prevent pressure build-up. Connect the outlet of the nebulizer to a mass flowmeter via an air filter. Connect the mass flowmeter to an electrical supply. Adjust the air supply to 5 L/min, with pressure remaining at 1.0-2.0 bar. Remove the mass flowmeter and disconnect the air supply. Connect the outlet of the nebulizer to a 15.9 mm tube, which bifurcates and connects to two Plexiglas boxes with the dimensions: 150 x 163 x 205 mm, fitted with removable lids. Each box should have a 5 mm hole in the side opposing the inlet, to prevent pressure build-up. Place up to 5 mice in each Plexiglas box and close the lids. Open the nebulizer and fill the insert with at least 4 ml LPS dissolved in sterile saline or vehicle alone (sterile saline; the volume should not exceed 8 ml). Re-connect the inlet to the air supply. Allow the aerosol to flow into the closed Plexiglas boxes for 10 min. Monitor the animals continuously. Make sure the air supply remains tightly secured to the inlet of the nebulizer. Disconnect the air supply. With the lids closed, let the animals remain in the Plexiglas boxes for 2 min. Open the lids and allow for the aerosol to disperse, and return the animals to the cages. If the animals appear wet, place the cages on a heating pad set to low heat, to prevent hypothermia. Monitor the animals continuously for the first 30 min, and thereafter every 2 hr for the first 6 hr. The animals should exhibit normal respiratory pattern and activity during and after the nebulization procedure. At the experimental end point, deeply anesthetize the animals with isoflurane to effect as recommended by your institution’s veterinary staff. Pinch the hind paw to check for a withdrawal reflex to ensure sufficient depth of anesthesia to conduct major surgery. Spray down the fur of the animals with 70% ethanol. Open the abdomen using scissors, and sever the aorta to exsanguinate the animal. Place a piece of tissue over the abdomen to soak up the blood. Follwing euthanasia, use a single anterior-posterior cut of the scissors to expose the thorax. Lift up the rib cage by the anterior tip of the sternum and use the scissors to puncture the diaphragm at the most ventral point, without cutting into any lung lobe. Open the ribcage by making two cuts in the anterior-posterior direction (meeting below the jaw). Gently pull apart the rib cage using forceps, and cut the trachea below the larynx. Lift up the trachea with the forceps and remove the lungs by cutting the ligaments connecting the lobes to the thoracic cavity, and gently pulling by the adipose and cardiac tissue. Insert a polyethylene tube (inner diameter: 0.58 mm; outer diameter: 0.965 mm) into the trachea and secure the tube with a string of silk thread. Tie off the multilobe (the four lobes of the right lung) with silk thread. Insert a 23 gauge needle into the polyethylene tube and slowly inject 250 µl of ice-cold sterile PBS into the single lobe with a 1 ml syringe. Carefully tap the lungs 30 times and collect the liquid through the syringe. Repeat the procedure with 200 µl PBS (approximately 300 µl PBS should be recovered from the single lobe from the total injected volume of 450 µl). Keep the bronchoalveolar lavage fluid (BALF) on ice, or enumerate the BAL cells immediately. Count the cells with a heamocytometer, using Turk solution to stain the cells11. Calculate the total cell number by multiplying the number of cells with the dilution factor of the staining solution and the volume within the counted field of the heamocytometer. Prepare differential cell counts from cytocentrifuged cells as described elsewhere11. Remove the multilobe and snap-freeze on dry ice. Store at -80 °C. Mount a 60 ml syringe with the plunger removed on a metal support stand. Fill the syringe with 10% formalin to the height of 20 cm above the laboratory bench, representing 20 cm of constant pressure. Connect the 23 gauge needle secured to the trachea to the 60 ml syringe via a plastic tube with a valve to control the flow of formalin. Insufflate the lung lobe with formalin for 5 min. Disconnect the needle and remove it together with the polyethylene tube from the trachea while pulling on the silk thread to close the trachea and retain the pressure in the lung. Submerge the lung lobe in formalin and fix for 24 hr at 4 °C. Embed dehydrated tissue in paraffin, cut in 4-5 µm sections, and stain with hematoxylin and eosin to allow for histological assessment. Challenge to aerosolized P. aeruginosa LPS usually yields a marked inflammatory response in the airway lumen and alveolar space, characterized by a predominance of neutrophils at both early and late time points. C57BL/6by and BALB/c mice were exposed to aerosolized P. aeruginosa LPS or vehicle alone and neutrophils were enumerated in BALF. The total cell number in BALF of C57BL/6by mice exposed to an aerosol generated with vehicle only is typically around or below 200,000 cells and the cells consist of 95-100% mononuclear cells, with only few lymphocytes (0.5-5%), and no neutrophils in the BALF (Figure 2A-C). Mice challenged with aerosolized LPS exhibit an increased total cell number in BALF, typically >500,000 cells after 6 hr. The cell infiltrates remains high after 24 hr. The cellular profile in BALF is shifted towards a predominance of neutrophils (80-95%) following LPS exposure (Figure 2B and C). Figure 2: Pulmonary neutrophilia in C57BL/6by mice challenged with 1 mg/ml aerosolized LPS. C57BL/6by mice were exposed to 1 mg/ml aerosolized P. aeruginosa LPS or vehicle (saline, white bar) alone for 10 min. Bronchoalveolar lavage (BAL) was performed after 6 hr or 24 hr and the leukocytes were enumerated in BAL fluid (BALF). (A) Total cell number (TCN), (B) neutrophils, and (C) mononuclear cells (MNC) in BALF. Significant differences were analysed using un-paired t-tests. n = 3-4, * indicates p <0.05, ** indicates p <0.01. A comparable increase in inflammatory cells in BALF is observed in LPS-challenged BALB/c mice (Figure 3A). In addition, the percentage of neutrophils and mononuclear cells in BALF after LPS challenge is comparable in C57BL/6 and BALB/c mice (Figure 3B and C). Figure 3: Pulmonary neutrophilia in BALB/c mice challenged with 1 mg/ml aerosolized LPS. BALB/c mice were exposed to 1 mg/ml aerosolized P. aeruginosa LPS or vehicle (saline, white bar) alone for 10 min. Bronchoalveolar lavage (BAL) was performed after 6 hr or 24 hr and the leukocytes were enumerated in BAL fluid (BALF). (A) Total cell number (TCN), (B) neutrophils, and (C) mononuclear cells (MNC) in BALF. Significant differences were analysed using un-paired t-tests. n = 3, ** indicates p <0.01, *** indicates p <0.001. Similar inflammatory cell profile and pulmonary neutrophilia is observed with nebulization of 5 mg/ml LPS (Figure 4A-C) and by intranasal delivery of LPS, as previously reported12,13. Figure 4: Pulmonary neutrophilia in BALB/c mice challenged with 5 mg/ml aerosolized LPS. BALB/c mice were exposed to 5 mg/ml aerosolized P. aeruginosa LPS or vehicle (saline, white bar) alone for 10 min. Bronchoalveolar lavage (BAL) was performed after 24 hr and the leukocytes were enumerated in BAL fluid (BALF). (A) Total cell number (TCN), (B) neutrophils, and (C) mononuclear cells (MNC) in BALF. Significant differences were analysed using un-paired t-tests. n = 3, *** indicates p <0.001. Neutrophils are observed in the epithelial submucosa, as well as spaces surrounding the conducting airways and blood vessels of LPS-challenged mice (Figure 5). Dispersed neutrophils are also detected in the parenchyma and alveolar region. Figure 5: Pulmonary localization of neutrophils in LPS-challenged mice. Hematoxylin and eosin staining of formalin-fixed lung tissue from (A) C57BL/6by mice exposed to vehicle alone or (B) 1 mg/ml aerosolized LPS sacrificed after 6 hr or (C) 24 hr. Arrow indicates a neutrophil. Bar indicates 200 µm. Please click here to view a larger version of this figure. The total protein content in the BALF of LPS-challenged mice is increased compared to mice exposed to saline (Figure 6). Also, the expression of the neutrophil chemoattractants chemokine (C-X-C motif) ligands (CXCL) 1 and CXCL2 are increased in LPS-challenged mice10 (Figure 7A and B). 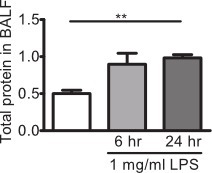 Figure 6: Increased total protein concentration in bronchoalveolar lavage fluid (BALF) of LPS-challenged C57BL/6by mice. Total protein content in BALF of mice challenged to 1 mg/ml aerosolized LPS or exposed to vehicle (saline, white bar) alone was measured by spectrophotometric analysis. Significant differences were analysed using un-paired t-tests. n = 3-4, ** indicates p <0.01. Figure 7: Increased expression of CXCL1 and CXCL2 in bronchoalveolar lavage fluid (BALF) of LPS-challenged mice. Expression of (A) CXCL1 and (B) CXCL2 in BALF of mice challenged to 1 mg/ml aerosolized LPS or exposed to vehicle (saline, white bar) alone quantified by ELISA. Significant differences were analysed using un-paired t-tests. n = 3. Aerosolized LPS generates an inflammatory response in the airways, characterized by neutrophils in the epithelial submucosa, spaces surrounding the conducting airways, as well as the alveolar spaces. This is, together with the increased total protein content in BALF, indicative of plasma leakage, representative of the pathology of acute lung injury. As LPS induces a sterile inflammation, the reaction is independent of the adaptive immune response, and there are limitations to the relevance to bacterial infections. The technique may, however, be used to dissect inflammatory mechanisms by excluding adaptive immune responses. Although the methodology is simple and easily adapted to answer different scientific questions, the choice of nebulizer and tubing is critical. The deposition of LPS and resulting neutrophilia must be validated with inlets, nebulizers and tubing other than what is described here. Furthermore, as less common mouse strains may display different responses to LPS, optimal doses of LPS should be determined for each strain. Moreover, the neutrophilic inflammation generated with aerosolized LPS is comparable with the inflammation induced by intranasal delivery of LPS, as observed by others12,13 . Although intranasal administration easily is performed, the methodology requires anesthetics and could potentially introduce the microbial flora of the nasal cavity to the lungs, as the nasal cavity is not sterile and the technique requires a large volume of vehicle. In addition to the relevance to acute lung injury, the technique may be further developed to include multiple challenges with aerosolized LPS. The methodology may thus be used to study pathogenic mechanisms in the chronic inflammation of COPD, which is associated with persisting neutrophilia14, together with reoccurring bacterial infections or permanent microbial colonization15. Thus, there is a particular relevance for the neutrophilic inflammation of LPS-challenged mice to the bacterial infections associated with COPD exacerbations, which are central for disease progression16,17. Challenge with aerosolized LPS can be set up at a small cost with few appliances and requires minimal training. Furthermore, the technique can thus be routinely performed on a large scale at any laboratory, with little or no variation between individuals and is thus superior to other routes of pulmonary delivery. Abraham Roos has received a lecturer fee from Boehringer Ingelheim, travel grants from AstraZeneca R&D and a research grant from AstraZeneca R&D. Magnus Nord is a full time employee of AstraZeneca R&D and has received research grants from AstraZeneca R&D. Johan Grunewald and Tove Berg are co-investigators on an unrelated research project funded by AstraZeneca R&D. We would like to thank Kerstin Thim (AstraZeneca, Lund, Sweden), Benita Dahlberg and Dr. Anders Eklund (Karolinska Institutet, Stockholm, Sweden) as well as Dr. Martin Stampfli (McMaster University, Hamilton, ON, Canada) for skillful assistance and expert advice. Purified Pseudomonas aeruginosa LPS Sigma-Aldrich Harmful. Recomended purification. LPS purified from other bactria may be used. TSI mass flowmeter 4040 TSI 4040 Alternative product from supplier may be used. Saint-Gobain 15.9 mm Tygon tube Sigma-Aldrich Z685704 Recomended brand. Plexiglas boxes with removable lids Custom built N/A 150 x 163 x 205 mm (a 2 mm hole on the side). 3M Half Facepiece Reusable Respirator 3M 7503 Recomended brand. 3M Advanced Particulate Filters (P100) 3M 2291 Recomended brand. Scissors VWR 233-1104 Preferred scissors may be used. Forceps VWR 232-1313 Preferred forceps may be used. Intramedic PE50 polyethylene tube BD 427411 Recomended brand. Ethicon 2-0 Perma-hand silk tread VWR 95056-992 Recomended brand. 26 ½ gage needle Alternative suppliers exist. 1 ml BD slip-tip syringe, non-sterile BD 301205 Alternative suppliers exist. 60 ml BD Luer-Lok syringe, non-sterile, polypropolene BD 301035 Alternative suppliers exist. Fluka Hematoxylin-Eosin Sigma-Aldrich 3972 Alternative suppliers exist. Table top centrifuge Alternative manufacturers exist. Cytospin 4 cytocentrifuge Thermo Scientific A78300003 Alternative centrifuge can be used. HEMA-3 stat pack Fisher Scientific 23-123-869 Alternative staining kits exists. Formalin solution, neutral buffered, 10% Sigma-Aldrich HT501128 Alternative suppliers exist. King, J. D., Kocincova, D., Westman, E. L., Lam, J. S. Review: Lipopolysaccharide biosynthesis in Pseudomonas aeruginosa. Innate Immun. 15, 261-312 (2009). Grommes, J., Soehnlein, O. Contribution of neutrophils to acute lung injury. Mol Med. 17, 293-307 (2011). Pesci, A., et al. Inflammatory cells and mediators in bronchial lavage of patients with chronic obstructive pulmonary disease. Eur Respir J. 12, 380-386 (1998). Hoogerwerf, J. J., et al. Lung Inflammation Induced by Lipoteichoic Acid or Lipopolysaccharide in Humans. Am. J. Respir. Crit. Care Med. 178, 34-41 (2008). Scheuchenzuber, W. J., Eskew, M. L., Zarkower, A. Comparative humoral responses to Escherichia coli and sheep red blood cell antigens introduced via the respiratory tract. Exp Lung Res. 13, 97-112 (1987). Asti, C., et al. Lipopolysaccharide-induced lung injury in mice. I. Concomitant evaluation of inflammatory cells and haemorrhagic lung damage. Pulm Pharmacol Ther. 13, 61-69 (2000). Brand, P., et al. Total deposition of therapeutic particles during spontaneous and controlled inhalations. Journal of pharmaceutical sciences. 89, 724-731 (2000). Liu, F., Li, W., Pauluhn, J., Trubel, H., Wang, C. Lipopolysaccharide-induced acute lung injury in rats: comparative assessment of intratracheal instillation and aerosol inhalation. Toxicology. 304, 158-166 (2013). Skerrett, S. J., et al. Role of the type 1 TNF receptor in lung inflammation after inhalation of endotoxin or Pseudomonas aeruginosa. American Journal of Physiology - Lung Cellular and Molecular Physiology. 276, L715-L727 (1999). Roos, A. B., et al. Lung epithelial-C/EBPbeta contributes to LPS-induced inflammation and its suppression by formoterol. Biochem Biophys Res Commun. 423, 134-139 (2012). Didon, L., et al. Lung epithelial CCAAT/enhancer-binding protein-beta is necessary for the integrity of inflammatory responses to cigarette smoke. Am J Respir Crit Care Med. 184, 233-242 (2011). Silverpil, E., et al. Negative feedback on IL-23 exerted by IL-17A during pulmonary inflammation. Innate Immunity. 19, 479-492 (2013). Mercer, P. F., et al. Proteinase-Activated Receptor-1, CCL2 and CCL7 Regulate Acute Neutrophilic Lung Inflammation. American Journal of Respiratory Cell and Molecular Biology. (2013). Korkmaz, B., Horwitz, M. S., Jenne, D. E., Gauthier, F. Neutrophil Elastase, Proteinase 3, and Cathepsin G as Therapeutic Targets in Human Diseases. Pharmacological Reviews. 62, 726-759 (2010). Bafadhel, M., et al. Acute Exacerbations of COPD: Identification of Biological Clusters and Their Biomarkers. Am. J. Respir. Crit. Care Med. 201104-200597 (2011). Hurst, J. R., Perera, W. R., Wilkinson, T. M. A., Donaldson, G. C., Donaldson, G. C., Wedzicha, G. C. Systemic and Upper and Lower Airway Inflammation at Exacerbation of Chronic Obstructive Pulmonary. Am. J. Respir. Crit. Care Med. 173, 71-78 (2006). Rabe, K. F., et al. Global Strategy for the Diagnosis, Management, and Prevention of Chronic Obstructive Pulmonary Disease: GOLD Executive Summary. Am. J. Respir. Crit. Care Med. 176, 532-555 (2007).